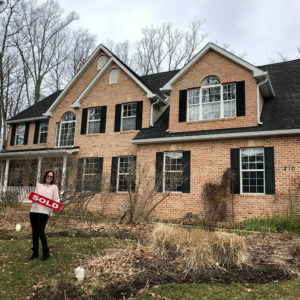 Rachel helped us find the home of our dreams! She is so kind, professional, and knowledgeable about real estate. She made this complicated, sometimes frustrating process that much easier and more understandable for both my husband and me. She is the kind of realtor who can explain the details of a contract, as well as get out a flash light and look for signs of mold under the stairwell. (She has a magic nose, I swear!) This is not a woman who is trying to slap lipstick on a pig and sell it to you: she is on YOUR side trying to find out what is wrong with a house, so you are buying it with eyes wide open! Additionally, she has given us great advice on how to make reasonable changes to list our own house, to make it marketable without breaking our bank. I cannot recommend her enough!Ashley F.
Ashley came to me after looking for a new home, on and off, for two to three years. Her husband was working out of state for most of the time, so that added an extra layer of complexity in finding the perfect home for Ashley, her husband and children. Ashley knew that they wanted a home that was close to the Annapolis Mall, restaurants, and amenities. But, they were also looking for a home with a large private property. Ashley and I looked at a variety of homes that were for sale. Since her husband was out of town, I offered opinions on the house layouts and details, like flooring and counters. I was happy to be her secondary support system during the process, since her other half couldn’t be there in person. After a short search, we found the perfect home for the Fuchs Family. It was a large brick home on a private lot that overlooked a wooded area. It was minutes from the mall and area attractions. And, even better, it had a sauna and a theatre room! We had a few inspection issues pop up during the closing process, but they were easily tackled. In the end, Ashley had power of attorney for her husband for the settlement and handled the day like a pro. I was happy I could be there to support her on the big day, and I’m even more happy that Ashley and her family finally found their perfect home.